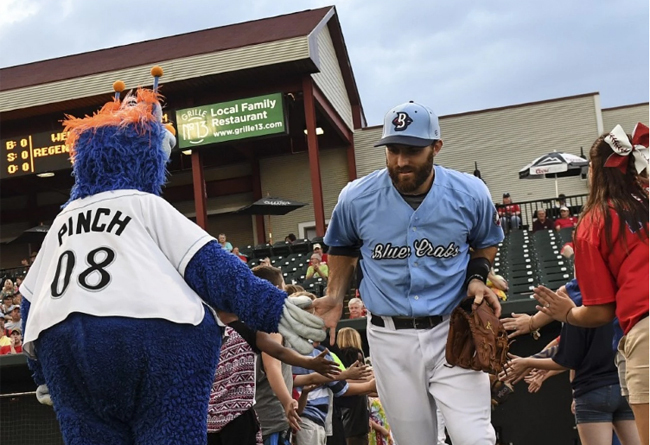 About five hours before the first pitch one day this week, the Atlantic League’s leading hitter walked into the modest home clubhouse at Regency Furniture Stadium. Some teammates had recently lunched on Burger King and Subway — “anyone need anything from the store: Walmart, Costco?” someone shouted out — but Steve Lombardozzi brought his meal in tupperware: chicken with pasta. The 27-year-old would soon begin the same routine he used in the big leagues: hitting in the cage from the right side and then the left, moving on to a focused batting practice, taking infield not in turf shoes (like some teammates) but in cleats, stretching by himself and also with the rest of the Southern Maryland Blue Crabs. Lombardozzi was less than 30 miles from the stadium where he became a fan favorite during Washington’s first playoff season since the Great Depression. But Regency Furniture Stadium — home of “Crustacean Nation” — feels like several overnight bus trips away from Nationals Park. Just look at the table in the clubhouse kitchen with its pile of raspberry Hostess Zingers, the equipment bags bearing logos of the Braves and Tigers and Cubs, or the manager jokingly picking a mock lineup out of a hat. Lombardozzi’s name came out fifth. “Damn, dude’s hitting .400 and he gets dropped from the 1 spot to 5?” Manager Jeremy Owens laughed. What is Steve Lombardozzi doing playing in Waldorf, for a few thousand bucks a month, and for an independent league club without a Major League Baseball affiliation? In some ways, the answer is about what happened in March, when he was released by the White Sox after signing a minor-league deal in October. (The decision to go to Chicago came before the White Sox traded for Todd Frazier and signed Jimmy Rollins.) But in other ways, the answer is about what happened during the four years since 2012, when Lombardozzi had more than 400 plate appearances for the best Washington baseball team in a generation. Former manager Davey Johnson said he didn’t want to turn Lombardozzi into a utility player, but circumstances conspired to do just that. In that season, he played more than 40 games at second base — his natural position — but also a dozen at third, one at shortstop, and more than 30 in left field, where he shared the outfield with fellow rookie Bryce Harper. The next season, his plate appearances dropped by a quarter, his performance dipped, and he was traded to the Tigers as part of the package that brought Doug Fister to D.C.
Before his first spring in Detroit ended, he was traded to Baltimore. He spent most of the next two seasons in Class AAA, amassing a total of 343 and 365 at-bats — both fewer than he had gotten during his rookie season with the Nats. In 2014, the Orioles sent him to the minors twice, and then traded him for cash considerations to the Pirates, where he was sent to the minors three times during the 2015 season and ultimately became a free agent. He got just 10 big-league at-bats last season, and put up worse minor-league numbers than he had as a 22-year-old. So Lombardozzi decided he needed something he hadn’t had since at least 2012: a chance to play every day, with the same club, without looking over his shoulder. His friend Tim Sexton, a fellow Maryland kid, had played last season for Owens and the Blue Crabs. The manager heard Lombardozzi might be available and reached out with an offer, one that didn’t even make the former big leaguer his team’s highest-paid player. Lombardozzi grew up in Howard County, about an hour north of Waldorf. He already owned a townhouse there. He talked with his father, his longtime coach and confidante, who still lives in the area. They agreed that a chance to play regularly and fix his game would be the best choice; that Lombardozzi should put his head down and play in Waldorf until the All-Star break, and then look up and see if anything had changed. Indeed, Lombardozzi has been devouring Atlantic League pitching. Through Thursday, he led the league in hitting (.359) and in hits (56, in 38 games). He was tied for second in runs, and fifth in on-base percentage. He already sparked interest from one MLB organization, but Lombardozzi wasn’t yet ready to leave. Lombardozzi is looking not at his stats, but at a bigger picture. He’s taking leads more aggressively on the basepaths. He’s hitting more consistently, and playing defense less tentatively. He’s acting not like a player afraid to do the wrong thing, but like one of the best players in the league, someone who will start in the middle of the infield and be at the top of the lineup every night, no matter what happened the day before. He’s taking bus rides to Connecticut and sharing hotel rooms on the road and bringing his own meals to the park, but he’s also having a blast. A blast, in the Atlantic League? Lombardozzi had his skeptics, and they’ll note that he has just eight doubles and no homers for the Blue Crabs. Still, look back at what people said about him when he was with the Nationals organization. “A manager’s dream,” longtime assistant GM Bob Boone said. “He looks like a big-leaguer,” GM Mike Rizzo said. “It’s no secret I like watching Lombo play,” Davey Johnson said. “There literally is not a player in the big leagues that works harder than this kid,” Ian Desmond wrote to the Detroit Free Press after the first trade. And then listen to Daryl Thompson, a former Expos draft pick who now pitches for the Blue Crabs. Or ask Owens, the manager, about his leading hitter. Local fans still stop both Lombardozzi and his father to talk about his stint with the Nats, and to ask about the future. He said his time with the hometown organization “was awesome,” and that “I don’t regret any of it.” He still talks regularly to former teammates such as Tyler Moore, Desmond and Adam LaRoche, asking them for advice. But he doesn’t dwell on how his progression got sidetracked — “you can drive yourself crazy trying to think about that stuff” — and he doesn’t worry about whether the Major Leagues will want him back. As for leading the Atlantic League in hitting? That’s fine. It isn’t why Lombardozzi spends his afternoons driving down 95 to the Beltway, exiting a few stops before the route to Nationals Park.